Location - Either at the customer’s site or at a training venue provided by the vendor. Lunch - All refreshments, including lunch, will be provided when the training is held at a venue arranged by the vendor. When the course is held on site, this is entirely at the customer’s discretion. Equipment Required - When the course is held on site, please ensure that there are ample chairs and tables; together with a power supply, a white wall or screen and a flip chart or white board. 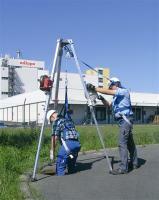 The instructor will bring many samples of FPE but examples of the equipment available on site would be useful. Assessment - Assessment will be by written test paper. Handouts - A comprehensive handout pack will be issued to all candidates on the completion of the course. Certification - Height Safety Awareness Training certificates will be issued to all candidates who successfully complete the course and achieve the required standard in the assessment. Validity - training certificates are valid for 36 months from the date of training. However, to maintain the level of competency gained from the training it is anticipated that the candidate puts the acquired knowledge in to practice on a regular basis. Safety Notice - We reserve the right to refuse to train any individual or to halt or cancel the training course if, in the opinion of the instructor, safety is compromised. This could be due to an unsafe or unsuitable training environment; an individual’s dangerous or poor conduct; the condition of any equipment supplied by the customer; or an individual suffering from health or fitness issues. High winds, in excess of 20 mph, will also lead to the curtailment of any practical training session. Should any cancellation or stoppage happen due to the reasons given above, we will endeavor to re-book the training as soon as it is safe to do so.